In the summer of 1856, Edward Payson Weston was struck by lightning and fired from his job at the circus. He was 17 years old and had been traveling with the big top for no more than a few weeks — “under an assumed name,” as he reassured the readers of his 1862 memoir, The Pedestrian. One day, as the troupe’s wagons passed near Tyngsborough, Massachusetts, he was “affected by a stroke of lightning” and nearly killed. Nineteenth-century circus managers were about as tenderhearted as you would expect when it came to physical infirmity. When Weston was too sick to perform in Boston a few days later, he was unceremoniously sacked. For most of us, being hit by lightning and kicked out of the circus would be an extraordinary turn of events. For Weston, it was a pretty typical week. Weston, whose story is recounted in the spectacularly entertaining book A Man in a Hurry, by the British trio of Nick Harris, Helen Harris, and Paul Marshall, lived one of those fevered American lives that seem to hurtle from one beautiful strangeness to the next. By his mid-teens, he had already: worked on a steamship; sold newspapers on the Boston, Providence, and Stonington Railroad; spent a year crisscrossing the country with the most famous traveling musicians in America, the Hutchinson Family Singers, selling candy and songbooks at their concerts; and gone into business for himself as a journalist and publisher. In his 20s and 30s, he somehow became one of the most celebrated athletes in the English-speaking world despite the fact that he was physically unprepossessing — 5-foot-7, 130 pounds, with a body resembling “a baked potato stuck with two toothpicks,” as one journalist wrote — and that his one athletic talent was walking. Just straight-up walking made Weston, for a while, probably the biggest sports star on earth. Edward Payson Weston was born in Providence, Rhode Island, on March 15, 1839, into a respectable, if slightly eccentric, middle-class family that could trace its origins back to the Mayflower. His father Silas stood 6-foot-4, played the viol, and wrote poetry. When Weston was 10, Silas disappeared to dig for gold in California. He wrote a book about the experience, Four Months in the Mines of California, or Life in the Mountains, that his teenage son published in 1854. Weston’s mother Maria wrote sentimental novels with titles like The Weldron Family, or Vicissitudes of Fortune and Kate Felton, or A Peep at Realities. Weston published some of these, too. The family, not atypically for the 19th century, was constantly breaking up and reforming as various members traveled and got married. Weston went to school in Boston, apprenticed with a jeweler in Providence; in 1859 he pops up, age 20, working at a newspaper in New York. He was fragile, sensitive, and prone to reckless fits of enthusiasm as well as deep periods of despondency when one of his enthusiasms didn’t work out. (It was during one such depression, after the failure of his venture to publish his father’s travel book about the Azores, that he left home and joined the circus.) All his life, Weston had a keen gift for sales and self-promotion crossed with a baffling gullibility in the face of bad bets, sham investments, and get-rich-quick schemes, which more than once swallowed everything he had. He loved flamboyant clothes, crowds, and being the center of attention, but he also felt a constant anxiety about whether he was respectable in the sense promulgated by his mother’s novels. His family was mortified when he became a professional walker. They accepted the decision, reluctantly, only when he promised his mother that he would never walk on the Sabbath — a promise he kept for the rest of his life. Weston’s athletic career started with two things: an insane bet, and the election of Abraham Lincoln as president of the United States. During the 1860 campaign, Weston bet his friend George Eddy that Lincoln would never win the White House. If he lost the bet, Weston would have to walk the 478 miles from the Massachusetts State House in Boston to Washington, D.C., to watch the inauguration. As it happened, Lincoln won a four-way race with 39.8 percent of the popular vote, and Weston set out in the deep winter of 1861. Weston, with his instinct for publicity, made sure that a large crowd gathered to see him off. Women gave him kisses to take to the president.1 A group of drummers followed him around. Debt collectors descended to arrest him — he was always in debt — but were persuaded to let him go. After leaving the festival at the State House, Weston tromped for 10 straight days through snow, mud, and ice, sleeping an hour here and there, trailed by a carriage hauling his judges and friends. He fell repeatedly. Away from the crowd, he became dejected and irritable. At one point, as he writes in his memoir of the event, he “complained of a severe pain in his chest, and attributed it to the eating of mustard on sandwiches.” (Nineteenth-century sports science!) In the end, he made it to the Capitol a few hours late for Lincoln’s inauguration, but word of his endeavor had spread, and he attended Lincoln’s first levee at the White House. The new president offered to pay his train fare back to Boston, but Weston theatrically insisted that since he had failed in his task, he would walk back. When the war broke out in April, Weston volunteered to put his walking powers to the service of the Union Army by sneaking in disguise through Baltimore, which had been cut off by the Confederacy, to deliver mail to Northern troops in Annapolis and Washington, D.C. In his memoir, Weston dutifully notes that his disguise (“a Susquehanna raftsman on a bender”) was provided by Brooks Brothers, and that he was given a lunch to take on the journey by the Howard Hotel.2 A New York regiment mistook him for a Southern spy and arrested him, but he talked his way out the next day, as he always did. Competitive walking — pedestrianism, it was called — had existed before the mid-19th century. In 1809, a Scottish laird called Robert Barclay Allardice had caused a sensation by walking 1,000 miles in 1,000 hours for 1,000 guineas.3 But it was only after the Civil War that “the pedestrian mania,” as Harper’s Weekly called it in 1867, really took off in the United States. There were women there whose bleached hair, cheeks flushed with rouge, gaudy costumes, and “loud” manner showed them to be fast; there were gamblers with big diamonds and dyed moustaches, and there were dwellers in the lower strata of society; but these collectively only formed a minority of the crowd, for with them sat hundreds of respectable people, intent on seeing every feature of the great walk. Races were brutal endurance events, lasting many days; one of the central tactical questions the competitors had to face was when, and for how long, to pause for sleep. Walkers would push themselves to cover 400 miles in five days, or 500 miles in six days, often suffering bloody feet — think about doing 3,000 laps in mid-Victorian footwear — swollen joints, and nastier injuries. There were deaths on the track. Because of the influence of gambling, top competitors faced a constant danger of attacks intended to stop them from spoiling a bet; big matches often involved heavy police protection. Most hauntingly of all, to my mind: The crowds were kicked out at night, but the races kept going, hours and hours of exhausted men passing in silence around enormous, empty halls, judges noting their progress as they went. The other form of pedestrianism was outdoor destination walking, of the sort that initially made Edward Weston famous. In 1867, he became a household name by walking from Portland, Maine, to Chicago in 26 days, 1,200 miles along the post road. Weston was greeted by massive crowds everywhere he went; newspaper writers around the country worked themselves into a froth debating the merits of the undertaking. He dined along the way with Grover Cleveland and Millard Fillmore. “Fake Westons” turned up in several cities, sometimes generating huge crowds of their own before the ruse was discovered. On this walk, Weston also found himself at the center of a national controversy due to his supposed involvement with the gangster and Tammany Hall politician John Morrissey. A side bet on Weston’s walk to Chicago meant that Weston stood to win extra money by walking 100 miles in 24 hours. He failed at this task several times, and wild rumors circulated to the effect that he was being paid off by Morrissey to throw the bet. The newspapers’ handling of the rumors soon took on unfortunate screaming-sports-pundit qualities, with various writers competing to denounce Weston as furiously as possible.4 For a few weeks in the fall of 1867, the question of whether Edward Weston was a “humbug” seemed like one of the most pressing issues facing American culture. Either way, a delirious crowd greeted him in Chicago. He climbed to the podium and gave an impassioned speech in defense of his good name. From the very beginning, one of the central questions raised by organized sport has been whether it has moral value — whether athletic competition fosters virtue and makes society stronger, or whether the spectacle it offers is merely a decadent entertainment. Weston, whose showman’s instincts were always running against his yearning to be viewed as “respectable,” seems to have internalized this conflict in a particularly extreme way. He was never happier than when showboating; during one race, in England, he seized a cornet from a band member and pranced around the track playing “God Save the Queen.” He was terribly vain and made a habit on long walks of stopping to change clothes before arriving in a town.5 He befriended P.T. Barnum, who helped to promote several of his races. On the other hand, he invested enormous time and energy in trying to make his walks appear to serve some larger purpose, with an eye toward winning the approval of polite society. Weston’s early trips to London in the 1870s made him a star on two sides of the Atlantic. He left a series of British challengers broken and exhausted, and ingratiated himself with the crowd by pledging his love for England. As the popularity of pedestrianism soared, however — largely, it should be said, because of his influence — he soon found himself being surpassed by other, often younger, competitors. His once-astounding feat of walking 500 miles in six days began to be seen as a rite of passage rather than an unassailable record. 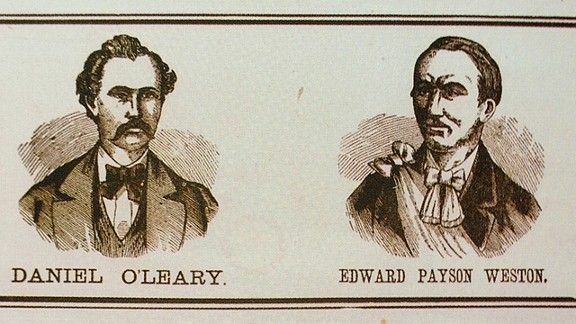 Some of his rivals, such as Daniel O’Leary, an Irishman from Chicago who beat him in three straight contests, became major celebrities themselves. By 6:30 p.m. on Saturday Weston had made 530 miles. At 9:30 he clocked 542, beating Brown’s record by seconds, and announced that he had breath enough for 550. The crowd roared their approval and on a track carpeted by flowers thrown from the galleries above Weston picked up his feet and trotted the last eight miles in 85 minutes. As he passed his tent on his last lap, he was handed a British and an American flag and carried them round the ring as the band played ‘Yankee Doodle’ and ‘Rule Britannia’. When Weston’s ship arrived in New York, thousands of people turned out to welcome him home. He stood at the ship’s rail and raised the Astley Belt over his head. The roar from the crowd was louder than the roar of the ocean. In his later years, Weston retired and unretired from pedestrianism a number of times, sometimes because he was broke, sometimes because he missed the limelight, always on behalf of some cause or other. He never quite got middle-class respectability right — a ladies’ man, he wound up separating from his wife and taking up with a much-younger woman whom the papers euphemistically described as his “niece” — but he never stopped longing for it. “It is a pity,” he told the Philadelphia Ledger in 1891, that pedestrian contests “cannot be conducted on the elevated plane they once were.” He walked throughout eastern New York giving speeches for Republican political candidates. In 1907, in his late 60s, he repeated his 40-year-old feat of walking from Portland, Maine, to Chicago, this time to prove that anyone who lived healthily could stay strong into old age. Finally, in 1909, he decided to walk from one side of the country to the other: New York to San Francisco in 100 days. The cause this time was pedestrianism itself, to keep it from being surpassed by the newer sensation, running. He left on his 70th birthday. He walked most of the way alone because the car that was supposed to follow him kept breaking down on rough terrain. He walked along railroad tracks, learning to sense the vibrations that meant a train was coming. The further west he got, the harder it was to find food and shelter. In Wyoming he experienced an isolation so profound it terrified him. He saw no one but the occasional railway worker and the hobos waiting for the trains. In the Nevada desert he was blasted by 102-degree heat and swarmed by black clouds of mosquitoes. In the High Sierra train engineers guided him between snow sheds. He crossed the same terrain where his father had searched for gold 60 years before. Eventually he made it to San Francisco. He was five days late. So he tried again. This time he was 71 and went from west to east. He made it to New York 13 days early with his ankle wrapped in bandages. There were 500,000 people packed on Broadway to cheer his arrival. Pedestrianism was, of course, completely supplanted by running despite Weston’s best efforts, and now lingers as an influence only in a few fringe sports (Olympic racewalking, certain forms of extreme marathoning). A week after his 88th birthday, Weston was hit by a cab in New York — did he ever do anything non-theatrically? — and never walked again. He died at the age of 90, on March 15, 1929, 68 years after Lincoln offered to buy him a train ticket. If Weston matters at all today, it’s not because of his sporting records, bizarre and impressive though they are, or for the moral causes he advertised, most of which now seem quaint if not actually sinister.9 To me, what’s most affecting about his story is the way he prefigured modern sports in creating, at his best, an experience that transcended all the justifications people had to give themselves in order to enjoy it. You either care about middle-class respectability or you don’t, but the moment of pure delight when Weston grabbed the cornet and started playing “God Save the Queen,” or the moment when he staggered to the finish, in one of his silly costumes, after doing 500 miles in six days for the first time — that’s the deeper part of sports. It wasn’t his causes that mattered, in other words. It was his character. It was his weird, trivial, utterly beautiful life. One of the many ways in which Weston prefigured modern sports culture was his instinct for finding sponsors and his devotion to them once found. Allardice, who was known as Captain Barclay, later trained the prizefighter Tom Cribb for his second fight against Tom Molineaux, which I wrote about here. It didn’t help that he reeked of alcohol. In fact, he wasn’t a heavy drinker, but he believed that whiskey prevented blisters and poured it copiously into his boots. And here is how weird the 19th century was: When it was revealed that Weston had secretly chewed coca leaf, the root ingredient in cocaine, during at least some of his walks, the major controversy was not whether this invalidated Weston’s athletic feats but whether it invalidated the urine study. Yes, it included an actual championship belt. I repeat: 19th-century pedestrianism had its own championship belt. Just to put that in context: Go for a five-mile walk. You can do that, right? Now do 17 more five-mile walks by the end of the day. Now do that for six straight days. You’re still 10 miles short. Nothing against the temperance movement, Republican political candidates, or H-O Oatmeal, all of which seem about equally in tune with today.